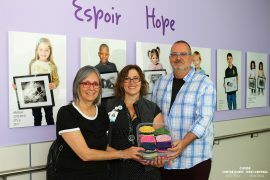 Street Nurse Myriam Kaszap (left) and Social worker Judith Sigouin from the Connexion team were given colourful scarves and hats from the Knitting Bees, a club initiated by Department of Finance employees. 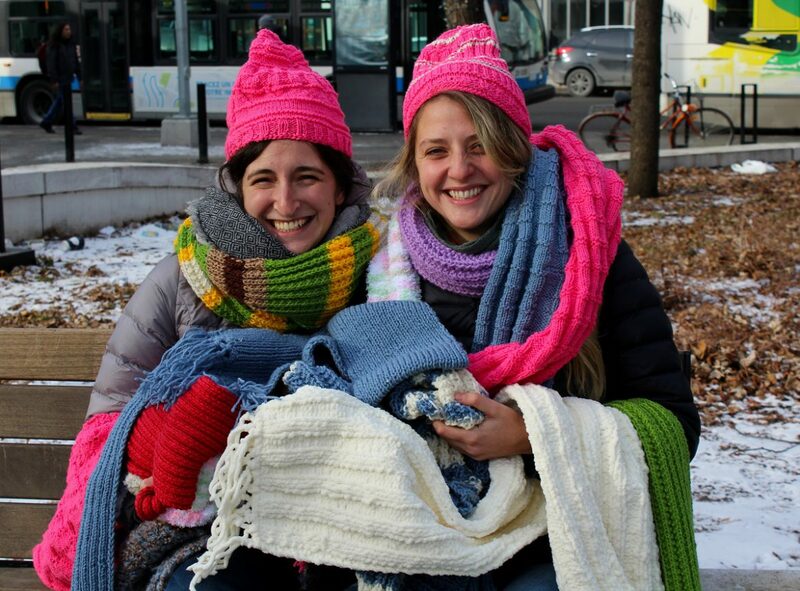 Throughout the winter, the duo has been donating the knitted items to their clients. This article will be presented as a series in 360. Read more about Connexion in upcoming editions of the newsletter. 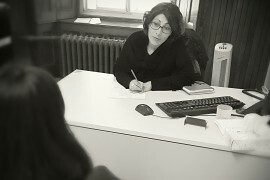 Connexion began with one social worker, who was recruited by the federal government as part of a research project to study homelessness in the western sector of Montreal. The findings turned up a different profile than expected, of youth concentrated in the Berri-UQAM district of Montreal. Instead, it appears that the homeless population moves around, is aging, and is largely comprised of English-speaking people. “We discovered that the scope of homelessness had expanded,” remarks Judith Sigouin, a Social Worker with Connexion since 2013. Today, the Connexion team is made up of two social workers and one active nurse who take to the streets of Montreal to work with the homeless that are disconnected from services offered in our CIUSSS. 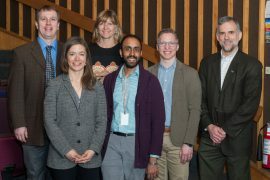 The initiative is offered by the network’s Mental Health and Addiction Program. Ms. Sigouin and Myriam Kaszap, a Street Nurse for eight months, spoke to 360 about their experiences with this unique program based out of CLSC Metro. 360: How would you describe your client profile? Connexion: The clientele we serve varies from one area to another. In the downtown area, the homeless population is mainly English-speaking, although French is also heard. There are First Nations peoples, immigrants and Canadians from other parts of the country. In the western parts of town, it’s a split, with English appearing to be more predominant. We see a different form of homelessness in Côte-des-Neiges, which is more residential. It is usually less chronic than what we see downtown, but more hidden. Typically, in this area, clients are culturally diverse, new to the area, and made up of families. 360: What territory does the program cover? Connexion: We cover the western portion of downtown, Montreal, Park Extension and Côte-des-Neiges. However the homeless are usually itinerant, they move around. So if someone requires our help in Notre-Dame-de-Grace or around Cavendish, we go see them. We also go beyond our territory to shelters in the south-west and south-central part of town. 360: Do your clients require a Health Insurance Card to receive services? Connexion: Half of all of the homeless people we serve have either lost their RAMQ card, or have one that has expired. For us it makes no difference. We see them anyway. To consult a doctor, obtain medication or visit a hospital, it is difficult without a card. They will receive care if they present to an Emergency Room, but without a valid RAMQ, they will receive an invoice afterwards. 360: Do you offer services that target specific clients? Connexion: Our program’s mandate is to create links to the healthcare network for the homeless population. 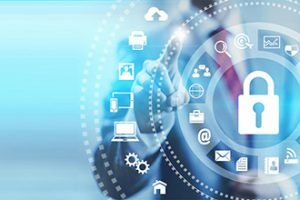 But even people with prior access to services and programs within our CIUSSS can fall through the cracks, owing to the complexity of their situation. We are able to ‘catch’ these individuals and help them reconnect to long-term services not linked to homelessness, such as homecare, mental health resources and front-line physician care. We also work with people on a shorter-term basis who cannot be referred to any other healthcare team, either because they have fallen through the cracks or owing to a lack of available services. Our team has the necessary expertise to provide care particularly to individuals who are homeless, marginalized, who have addictions or engage in criminal behaviour. 360: What do you mean by people who “fall through the cracks”? Connexion: We see a range of profiles. For example, there are limited services available in our sector for people with substance-abuse problems. It is also difficult for doctors to treat elderly people who are homeless, who have lost their autonomy and who move around all the time. Besides, this doesn’t fall within a doctor’s mandate. We have to find a way to intervene with people who are isolated, otherwise they get caught in the revolving door syndrome within the hospital system. These individuals often don’t have a health insurance card or a family doctor, and their lifestyle does not include going for a regular checkup, or other preventive visits to a healthcare team. We end up seeing them when a medical condition, like diabetes, gets out of hand. They become homeless and wind up in intensive care. There are a range of profiles. 360: Was the program developed following a certain model? Connexion: Connexion had existed as a project for a long time. It was difficult in the early stages but the service was built up over time. It may have been inspired by other programs, but is very different because the training and clientele are not the same. Connexion’s structure was designed by the social worker in charge at the time, and the workload was heavy. However, these circumstances led them to be creative and resourceful. Connexion was developed directly on the ground. We try things and see what works, what doesn’t work, what we should keep doing and what we shouldn’t. It’s a somewhat unconventional approach, but has been very effective. That said, we do want to bring some structure to the program, but find a way to preserve the healthcare professional’s autonomy and ‘outside the box’ way of thinking. 360: Is the program unique in Montreal? Connexion: There are similarities between Connexion and the Homelessness Assistance Team of CLSC des Faubourgs, for instance, who developed many programs that are very solid. But we don’t work in the exact same way. As our name suggests, we are not self-sufficient—our goal is to connect people who are homeless to medical and psychosocial services that already exist. Our role is to develop an intervention plan that helps a marginalized person find their place in our CIUSSS, where they will always be accompanied, so that they can receive consistent support and access to ‘normal’ services. 360: Where do you find your clients? Connexion: Any number of ways. Many find us through word of mouth, mainly people who do not have access to any services. Of course, through our street work, we go to the clients. We look after people who are referred by our community partners. We also care for individuals who are referred through our network. Connexion doesn’t officially offer services to people who are already connected to the healthcare system, our raison d’être is to create that connection—but in practice, we do. Homelessness should not, in itself, bar someone from receiving services. A healthcare team should be able to manage the file of a homeless person. It is not from a lack of willingness, mind you. Emergency Room psychosocial staff at hospitals may simply not have the resources to properly care for this population, who in this instance are liable otherwise to fall through the cracks. Homecare services will do everything possible to keep someone from losing their home, but consult us to find temporary lodging for their clients who have become homeless. And crucially, we help people who have mental health or addiction problems, who are living on the street or are new to Montreal and have no RAMQ number. To whom else can they be referred, but us?